Last year, Hell Below filmed its principal dramatic re-enactments on board two museum ships: USS Cod, a Gato-class submarine in Cleveland, Ohio and U-995, a Type VII U-boat in Laboe, Germany. Both locations provided the production with fantastic opportunities to capture an authentic look and feel for the show. A typical day on either set would see 15-25 cast and crew on board. That’s a half to a third of what you might expect to have on a WWII vessel. Needless to say, these spaces are very cramped and make logistics challenging. All camera and lighting equipment had to be hauled on the sets each day and staged in various compartments. It was tough for our small production crew so we can only imagine the logistical realities for the men living and fighting for long periods of time on board. We’re always throwing Director of Photography Sean F. White into challenging and foreign environments. Shooting on WWII submarines would prove no different. Our Production Co-Ordintator, Dalila Jovanovic, caught up with Sean and they chatted about some of the demands and rewards of the shoot. What was the most challenging part of filming at the USS Cod? White continues about his crew, “We are a very tight, small crew that works very well as a unit. Some of the compartments were so tight that we had to stage cast and crew in other rooms. Sometimes the Director, Ian Herring, would be wedged up in the corner of the room on top of an apple crate, watching the scene. It’s far from your feature film scenario with huge tents and cables running everywhere and people sitting down in chairs looking at monitors. This is guerrilla style work but we were all united in the vision of how to achieve it. What about the set of U-995? How did the U-boat differ from the American submarine? Were there any particular challenges there? “Well the U-boat was smaller, so there was even less space than the US submarine.” White elaborates, “The US sub by contrast was luxurious – wider spaces for the crew, wider and taller corridors, bigger doors. The U-boat was more condensed. At this point, our crew was more accustomed to submarine the environments. But I think most of my injuries were sustained on the U-boat. We also spent a lot of filming on the deck. The nature of the design for the U-boat made it very difficult to film. We had to strap ladders on the deck and weigh them down. We literally harnessed ourselves on to the side of the submarine to get our shots of the bridge watch. We were about 40 feet off of the ground and spraying water, wind, and smoke. Was there a particularly fun scene to shoot on set? Hell Below also shot scenes on the HMCS Sackville to represent the British sailors aboard Atlantic convoys and created a Special Effects submarine in Langley, BC, for some of the more action-packed sequences. The dramatic re-enactments are a huge part of the series and bring a real sense of authenticity to the visuals. The crew of Hell Below had a small taste of what submarine life might have been like for the young sailors of the Second World War and were fortunate to walk away with some stunning imagery, plenty of stories, and only a few bumps and bruises. 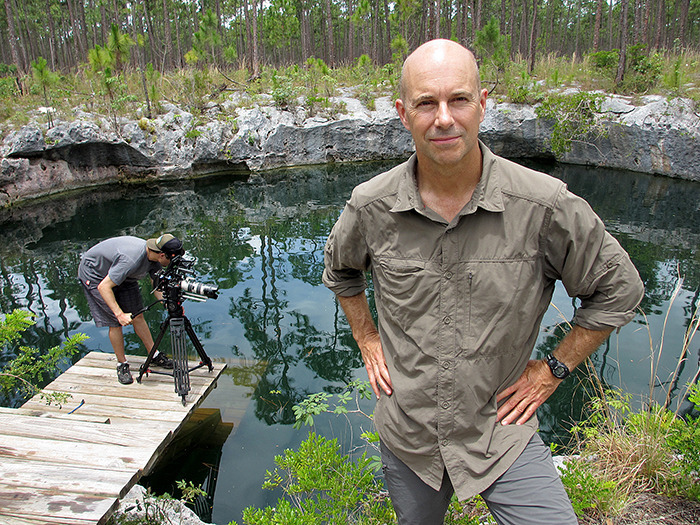 Hell Below is currently airing on Tuesdays on Smithsonian Channel in Canada. The episodes are available for Canadian viewers online for a limited time after broadcast here. We look forward to announcing more worldwide broadcast dates shortly. Stay tuned!